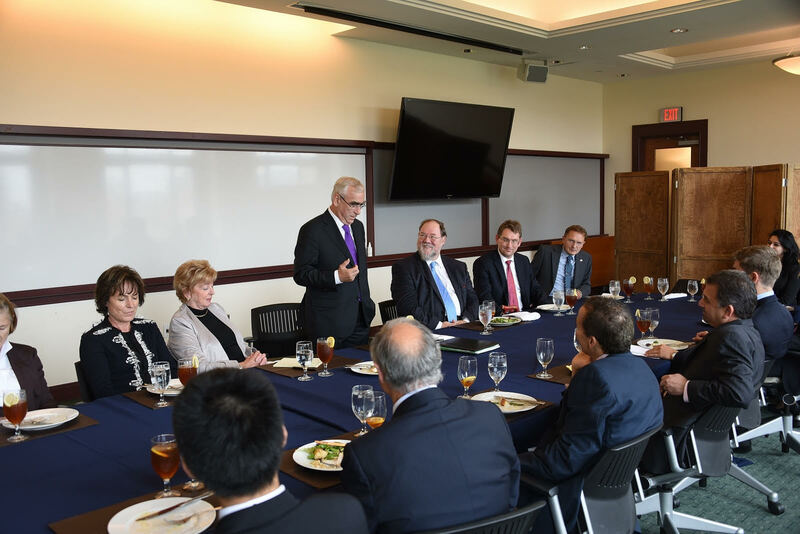 On the first of October, Professor Michael Czinkota hosted a private lunch with Dr. Theo Weigel at the McDonough School of Business, in collaboration with the Washington D.C. office of the Hanns-Seidel Foundation. Dr. Weigel served as the German Minister of Finance from 1989 to 1998, in the Cabinet of Chancellor Helmut Kohl. He was instrumental in the creation of the European monetary union, and the common currency. He was accompanied by a team of delegates that included his wife, Irene Epple-Weigel, the former alpine skier and Olympic medalist, and their son, Konstantin, a law student in Munich. Also part of the delegation was Richard Teltschik, the Director of the Hanns-Seidel Foundation in Washington. 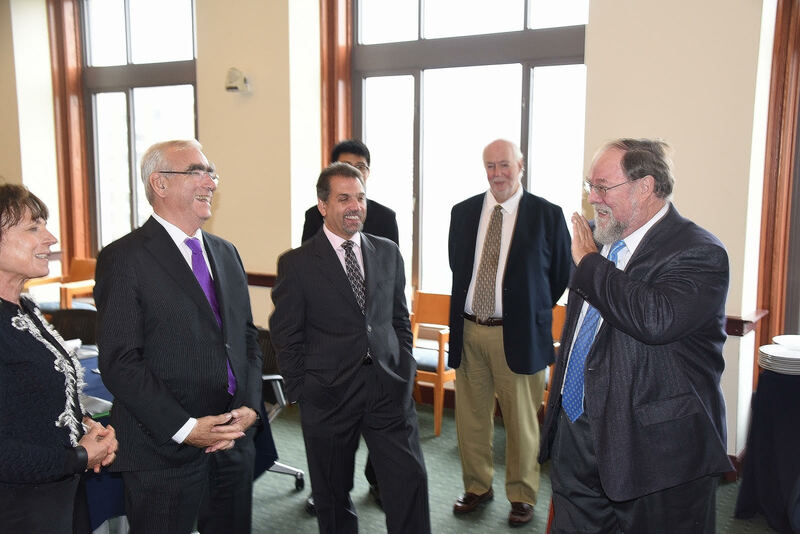 Georgetown University was represented also by Professors Thomas Cooke, Ricardo Ernst, Charles Skuba, David Walker, and Lee Pinkowitz. Also in attendance were three students – one from the McDonough School of Business, and two Masters candidates from the Walsh School of Foreign Service. Additional visitors came from the Hanns-Seidel Foundation and the German Embassy. 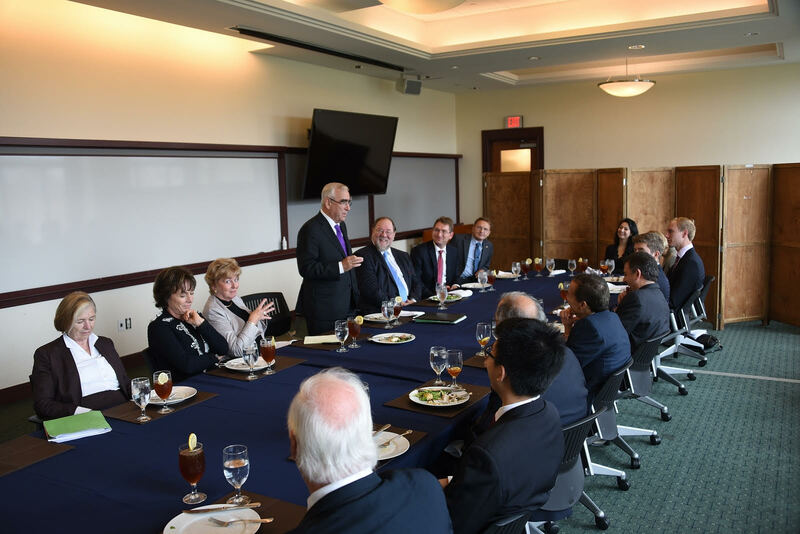 The lunch was inaugurated by Professor Czinkota, who gave a welcome address that included an introduction of Dr. Weigel’s many accomplishments. Following this, Dr. Weigel addressed the attendees of the lunch. He discussed his experiences with the creation and establishment of the Euro, relating both facts and anecdotes. One such story was of how the common currency came to be known as the “Euro,” rather than the other alternatives under consideration at the time, such as the Frank, Mark or ECU. He vehemently denied the common perception that the Euro was Germany’s reward of others for support of reunification, asserting that the two momentous events were planned and executed separately. Dr. Weigel talked about the fall of the Berlin Wall and the reunification of West and East Germany, at what was the eve of the 25th anniversary of the reunification. Yet it was not only German history that was discussed at the lunch, but also contemporary German politics and European current affairs. The issue of the refugee crisis in Europe was explored by Dr. Weigel as well as the other participants. Dr. Weigel believes that Germany can absorb the current volume of incoming refugees, approximately 800,000, for one year (possibly two). This will help the German economy, which is currently facing a demographic shortage of working-age and job-seeking citizens. Any absorption of refugees beyond this number, however, would end up harming the German economy. For more than an hour, issues such as U.S.-Germany relations, collaborations and perceptions by the youth of the two countries, and Germany’s leadership role in the world were addressed in the question and answer session following Dr. Weigel’s speech.